For the first time ever, the Flagler County school district has a finalist for the state-wide Teacher and Employee of the Year award. Sue McVeigh, a Flagler district employee since 1987 who works in the Exceptional Student Education Department, was named a finalist as a non-instructional employee. She will be attending the award breakfast on May 17 at Legoland in Winter Haven. Harriett Holiday, the district’s human resources director, announced the news to the Flagler County School Board, which was meeting this evening. The announcement, at around 8 p.m., came just two hours after Holiday herself had learned the news. “So how many of us can go?” Superintendent Janet Valentine asked. McVeigh was honored as the non-instructional employee of the year locally at an award ceremony on Jan. 17, along with Colleen Newman, who was named Teacher of the Year. Newman teaches at Belle Terre Elementary. Newman had her own special honor earlier this month when she was one of six teachers honored by Gov. Rick Scott and the Florida Cabinet. Newman received the Governor’s Shine Award. 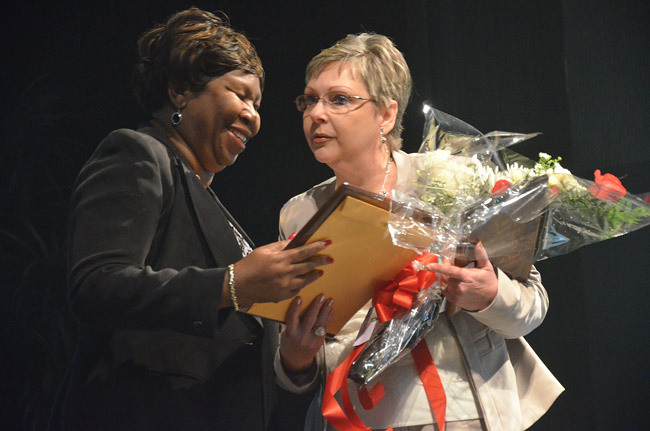 The school awards are split in two categories to ensure that those who work behind the scenes rather than as teachers in classrooms—bus drivers, custodians, secretaries, aides, administrative staff—are also recognized. McVeigh has worked as a media aide, computer proctor, and exceptional education teacher in her years with the district. She is currently an ESE Parent Specialist, serving as a liaison between parents and the school system as well as between parents and the community. She is responsible for facilitating exceptional students’ academic, emotional and personal success. She has herself implemented new programs—from parenting classes to a surrogate parent program to Exceptional Family Saturday socials–to ensure that parents’ needs are addressed, and that they feel included. She was one of 12 employees in the district finals, and one of 67 in the state finals. “She is our very first in my—wow, how many years have I been here? Way too many,” said School Board member Sue Dickinson. “Thirty-two years. It’s the first time we’ve had a district winner for a non-instruct,” she said, using the short-hand for non-instructional personnel. So wonderful to have this exceptional honor bestowed on such an exceptional person. Too often those out and about in our community affecting positive change in the lives of those often disenfranchised and most in need, get back-burnered to the sensational. Way to go sue! May the light of this recognition shine also on the many who share your passion to simply make their worlds a little better and kinder by getting out of bed every morning. Congratulations on a LOT of hard work. Thank You Sue for all you do for our Children. Congratulations from Deanna and I. BeTheChange hit it right on; you certainly shine a light in our lives. We Love You !! !